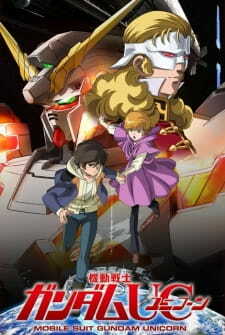 Mobile Suit Gundam Unicorn was awarded the Tokyo Anime Award in the OVA category twice in a row, in 2011 and 2012. Since the advent of the original Mobile Suit Gundam 0079, the Gundam franchise certainly has grown to become one of the most iconic shows in anime and has undoubtedly revolutionized the mecha genre itself. Now we take a look at the long-awaited, most recent addition to the Universal Century, Mobile Suit Gundam Unicorn. For those who know the Gundam UC timeline it is obvious, however for the newcomers, it should be known that Gundam Unicorn, despite its name, is not to be taken lightly. For the uninformed about Gundam history, it would be preferable, though not necessary, to watch other Gundam series in the UC timeline taking place before the date Universal Century 0096 and/or at least understand some basic terminology and history in this vast mecha universe. Summarily, Gundam Unicorn adds a final history of events to the early UC timeline masterfully concluding the first 100 years of UC. Now with everything said, we press forward to take our chance at possibility. The story opens with the creation of the Universal Century (UC) dating system itself, signifying a new era of exploration, prosperity and possibility. Now jump almost 100 years to UC 0096. Earth and space relations remain tense yet the people in space, the remaining Zeon struggle one last time for freedom after suffering many wars of defeat. A simple premise, but what exactly occurs during this period has potentially complex and profound consequences all humans living in earth and in space. Possibility. It has been mentioned in multiplicity already but with great reason. Such a powerful yet vague word and that can sum up Gundam Unicorn concisely. Why? The answer lies in Laplace’s Box, a mysterious unknown item to all of mankind that exists, but is rumored to tip the balance of power to the Zeon. As remarked by Full Frontal himself, “Would you believe in the possibility something so ambiguous yet so powerful?” This is why the Neo Zeon rise one last time. This is why they, the spacenoids, fight for the possibility of an object no human being knows about. This is why they must find Laplace's Box in order to break free from the Earth Federation’s grip and the key to the box is none other than the RX-0 Unicorn Gundam, the beast of possibility, the symbol of hope. The Gundam series has always focused on the philosophical and societal aspects of civilization. War, politics, human development. The Newtype myth, those held down by gravity, the harmony of human evolution. These themes are just some foundations that build the interactions in the Gundam universe albeit it wasn’t always effectively portrayed or was slightly excessive. Unicorn becomes an exception though. These themes still persist in it, and they are executed flawlessy. For a seven episode OVA, the pacing is nearly perfect. Maybe it is because it was this long(or short) that everything fit together timingly. When it is slow it is, calculating, deliberate and methodical. Likewise, when it is fast, it is quick, action-packed and intense. The only contingency in Unicorn is that compared its original novel counterpart, some events were compressed due to the length issue, but otherwise, Unicorn still manages to deliver and deliver with an outstanding ending. Typical with many Gundam series, characters in Unicorn are well diverse and developed. Our main protagonist is Banagher Links who finds and pilots the RX-0 Unicorn Gundam. He is your common young, naïve, idealistic protagonist, but just like all the Gundam pilots before him, we see his growth and development into a newtype, aided by friends and enemies. Aside from Banagher, Unicorn contains a multitude of other characters, old ones from previous Gundam installments that will cause a grin of nostalgia, and new ones that certainly become as memorable. Mineva Lao Zabi, Marida Cruz, Bright Noa(!!!). All of them are very unique in their own right and possibly even more enduring than Banagher himself. Of course, let us not forget Full Frontal, the masked antagonist, the leader of Neo Zeon. Certainly he is very unique. His presence and mysteriousness are what makes him so gravitating and his being as a whole is one of the most intriguing aspects of Unicorn, making him rightfully being named the “Second Coming of Char”. Once again, I digress into the original Mobile Suit Gundam. In retrospect quality of animation was decent but due to budget constraints it was lacking towards the end, but it is not the same situation for Gundam Unicorn. Given it being an OVA and its lengthy release, art direction and design most definitely outdid itself. The production values are absolutely off the charts. Animation is simply one of the best out there in modern standards. In keeping with the style of the Universal Century, the universe retains the sense of pseudo-realism and scale. Old and new mobile suits alike make an appearance that will absolutely steal and capture the moment. With all its military conflicts, battles occur decisively and are executed wonderfully. Animation of the mechanics and movement are fluid while destructive battlefields are viewed from every perspective. Attention to realism and detail is nothing short of perfect. Now one of the more disputed opinions is the use of CG at certain parts, particularly during the transformation sequence for the Gundams. However, it was probably necessary and appropriate to implement CG during these specific scenes to properly display the high level of detail in mechanical transformations while the Gundams themselves are not enacting human motions or actual movement. While the actual mechs are amazingly crafted, likewise can be said with the character design. Reminescent of the original Gundam style, it maintains a retro design on the characters. Keeping a mix of both old and new, the character designs are distinct and retain the qualities of earlier decades with updated modern animations that show the same level of detail on characters just as with the mechs themselves. Aside from the music, it should also be noted that voice acting itself is stunning. Both subbed and dubbed both deliver without fail and because of this the characters are very approachable and can easily be resonated with. Instaneously from the beginning, one can understand that the music is one to be remembered for Gundam. Sawano Hiroyuki has certainly outdone himself for the Unicorn soundtrack in particular even compared to his past and recent works. His music is very distinctive in its epic-like sounds and tones that effectively gives a rollercoaster sense of the moment that is occurring. Contrastingly, there are also the beautiful, memorable scenes where they become engraved in us and his music sets the tone and fortifies that. Hiroyuki has managed to give Unicorn a proper soundtrack that emotionally provokes and hypes us like no one else. That sense of longing, that feeling of hope, that chance at possibility. All those emotions are present in Sawano Hiroyuki’s Unicorn soundtrack. What this is, is a closing, an ending to the last years of the first century of Universal Century and Neo Zeon’s final actions. Has Unicorn solved all the problems of earth and space? Certainly not, but its happening and conclusion has done justice to itself and the UC timeline as a whole. Unicorn takes the best from Gundam UC and refines all of it skillfully. The characters, the plot, and the mobile suits make it worthy of a being Gundam. For those who might only see this one series individually, Gundam Unicorn is still well worth its time, but more consequently, as part of the Universal Century, it is a masterpiece and an integral addition to the Gundam series. In short, take a chance at possibility and go watch Gundam Unicorn. Hey, Mobile Suit Gundam Unicorn is finally a complete package and it's great, but who wants to read gushing? Not me, and I baselessly suspect I'm not the only one who combs through reviews for the most critical ones instead of the most adoring ones. With that said, this review will explore what makes Unicorn either worth mounting or nay, so saddle up! Let's start with disclaimers: watching previous entries in the Gundam Universal Century is optional, but it is a highly advisable option if you want to get the most out of Mobile Suit Gundam Unicorn. You will be able to follow the story, but scenes will definitely be lost on you. Also, for newcomers, the ending will make your brain leak out of your britches, so prepare a fresh set. With that out of the way, the story begins like most mecha shows in that a young boy, in this case Banager Links, lives in a nice little space colony. After everything that happens to a nice little space colony happens, he finds his way to a super awesome prototype mobile suit, a weapon called the Unicorn Gundam. The one who possesses the Gundam has the key to Laplace's Box, a mysterious secret that has the power to turn the tide of the war. Hence, since both the Earth Federation and the remnant peoples of the outer space nation of Zeon desire Laplace's Box, Banager becomes the fulcrum of the conflict by default. What a conflict it is! The fights and action in Mobile Suit Gundam Unicorn are spectacular, making several minutes of clashes between nameless grunt mobile suits highly entertaining to watch. This is doubly true when the battles are set against the grand sound track or the commendable, if sometimes long-winded, backdrop of the philosophical character dialogue that this series loves. However, the biggest problem with Banager Links as the protagonist---and indeed the show itself---is that he rarely involves himself in the conflict at all. It becomes obscenely common for Banager to strap himself into his machine and fly into every battle to make emotional pep talks with absolutely nothing of consequence happening as a result. He feels his way out of situations and screams his chipmunk-esque head off about how everyone is wrong. This, of course, solves nobody's problems, fails to advance the story, and even agitates the situation, as it should. The problem is that it can quickly irritate the viewer, too. If you are a mature viewer intrigued by the war drama aspect and practical conclusions to conflict, Banager's naivety will infuriate you almost incessantly until you will have to get your enjoyment from the other characters. Finalizing on that, if you enjoy your protagonist to best opponents through strength, skill, or smarts, you'll be gravely disappointed by Banager's complete reliance on his mobile suit; it's to the point you'll be surprised the Gundam doesn't brush his teeth for him before bed. Thankfully, the other main characters tend to make up for Banager's lack of depth. A renegade princess who actually has a goal, a desperate young soldier at odds with his station in life, and an adoptive father trying to atone with his daughter make great highlights of the show. They bring forward one of it's strongest aspects: emotion. Gundam tends to utilize emotion well, even exploiting it heavily, but this entry revels in that fact, making every main character a hook for your empathy and investigation. Side characters are a different story, though. Sometimes, a character that another character met only once conveniently becomes extremely important to them for no real good reason other than presumably horniness, love at first sight, or advanced understanding. In the Gundam's Universal Century timeline, evolved humans called Newtypes are much more in-tune with those around them, as well as other dimensions. Becoming invested in someone hastily makes sense for a Newtype, but it doesn't work for the viewer, who cannot appreciate these side characters without proper development. You might be dissatisfied to hear yourself ask "who was that?" during an apparently important scene, not knowing why it was important or why they were there, no matter how keenly you were watching. It isn't too frequent, but it does happen more than once, and it doesn't so much mar the show as much as it seems like missed potential, which is a sentiment that it shares with the plot. As everyone searches for answers to Laplace's Box, the viewer is along for the ride, but never allowed to speculate because placement and destination is ambiguous. Outside of the concept of Laplace's Box, its identity not revealed until very late in the progression; for all you know it could be slang for a part of a female's anatomy. So, make no mistake: your enjoyment of Mobile Suit Gundam Unicorn mostly hinges on how willing you are to indulge in an elongated, science fiction action-movie with sappy themes. Although each of the large scale action scenes could serve as a climax, it plays out exactly like a movie with one goal and little development. If that's up your alley or if you like mechs, space, or high technology then you'll likely find the show extremely compelling. Mobile Suit Gundam Unicorn is compelling, it just needed a little more to spur it ahead of its glaring flaws. Thank you for reading, now it's time for me to...hoof... it. The issue with Gundam Unicorn is that it sort of sits at a paradox. As a standalone, it's a hell of an anime; but your experience greatly depends on whether you have the knowledge of the Universal Century (you know, Mobile Suit Gundam) to fully grasp the scope of the anime. Unicorn serves as the penultimate conclusion to the Universal Century story that started back in 1979 in the timeless tale known as Mobile Suit Gundam 0079, the OYW (one year war). Growing up with Gundam, the story seen with my eyes absolutely differs from those who wanted to simply watch "a mecha" or "a gundam". Go find a Gainax anime or Studio Bones anime, for Mobile Suit Gundam Unicorn is a direct continuation of CCA (Char's Counter Attack) rather than a new high budget Gundam project. It's not simply a Gundam... it's THE GUNDAM, and the final chapter for that matter. An example, those who rate this lowly also believe Banagher Links is a whiny two-dimensional cookie-cutter protag, and that Riddhie is an emo cry baby, and Mineva Zabi is a lifeless zombie, and Full Frontal's a bad guy who has evil/bad intentions and everyone should die. Those are associations created by those who do not fully comprehend the story told. If you haven't watch the previous TV series, and many times before for that matter, you're better off not watching it at all because it's not meant for you. This is an entirely exclusive experience, and you're not welcome to watch or rate unless your a fan of Mobile Suit Gundam... because Unicorn is simply not meant for you. If one plans to watch this improperly, you'll be taking back about a tenth of the experience (that being animation and ost), while Gundam aficionados are getting the full 100%. On a brighter note, it's never too late to watch the classics, because you're missing out on the most important anime of a lifetime. Go back an enjoy the masterpieces that are MSG 0079, Zeta, ZZ, CCA, even the OVA's 08th MS, and 0080. Go ahead and enjoy the metaseries and immerse yourself in it's rich universe. I may have came off as pretentious or discouraging, but truth be told, it is what it is. Oh yeah, and Art/Sound/Characters/ Enjoyment/Overall 10/10, like that matters. Note: This review was rewritten on 2015/11/28. It contains the same arguments and opinions, but with more concise writing, hopefully. The story of Unicorn starts off using a formula that has become very common for Gundam series. Basically, some event kicks off around the MC's home area, causing them to get pulled into a conflict. In 0079, Amuro was caught in a fight or flight situation within his home territory, and the same was true for Kira from Gundam Seed. Zeta Gundam was different in that Kamille put himself and others in harm's way due to his rebellious nature, rather than just trying to protect people. I felt this was important to bring up, because it marks the difference in the MCs of the various series. Some start off just trying to survive or do the right thing, while others are displeased with the life they have. In Unicorn, things are a little weird. The main character, Banagher, starts off a bit like Kamille, in that he makes choices that pile up, which result in him being pulled into a conflict. Although, unlike Kamille, it's almost as if Banagher's making an instinctual decision to be involved, since most of the time there's no reason for him to even care. It's like he realizes he's the main character of a show and is responsible for moving the plot forward. To make it even worse, he routinely blames other people for his continued involvement, even though he's given several chances to leave. That mentality gets old really fast. As for the actual story-line, it follows the mystery of Laplace’s Box, which rumors say holds some great power. I really do mean rumors, since each side has almost no idea what the box is or where it's located. Yet, apparently, this rumor is important enough to basically revitalize a war over. Most of the story involves the various factions traveling place to place and fighting as some clue about the box's mystery is revealed. When the mystery behind the box is finally revealed, well, it's pretty underwhelming. It's hard to explain why I felt this way without spoiling anything, but essentially its significance is overplayed. There's some major logical missteps the writers made in trying to make the box seem important (see the spoilers sections if you want to know the specifics of what I mean). In reality, the infrastructure of where the box is located is actually more useful than the box itself. Once the box's secrets are revealed, there's some pretty important monologuing, but it's not clear whether that amounts to anything. There's basically zero conclusion to the initial premise of the story, which is, "War is bad, so stop killing each other all the time." Instead, the ending is essentially, "Alright, cool, we found it, the end." All in all, the story is a real mess that seems completely lost and ends up amounting to nothing. Overall, there's the same standard affair of characters as nearly every other entry in the UC timeline. I found this boring since the presence of some characters felt forced and only done to appeal to fans. Also, many characters have either no character development or very erratic changes in personality. I've already gone into a bit of detail about the MC and his actions in the beginning, but in terms of the entire series, he has almost no character development. As stated earlier, he likes to blame others for his problems. Kamille from Zeta did this, but it was a bit more reasonable since people were doing some pretty nasty things. Most importantly, Kamille's complaining decreases over time and he becomes a person of action. Banagher, however, complains all the way from episode 1 to episode 7. In the end, he never seems to reach any real resolution with the actions he made, the actions of others, or why the whole mess started in the first place. Ultimately, he fulfills the strategic role of a Gundam pilot and not much else. As for side characters, many of them also exhibit no character development. Now, character development is not always needed to make for a good show (see Baccano! ), but there's a disturbing amount of still characters in Unicorn. Although, there was one character that seemed like they were trying to make up for this void by flipping personalities every couple of episodes. These changes came across as extreme and unsubstantiated reactions whenever they occurred. It was kind of like, "Oh, I guess that happened." So, again, like the story, the characters are a mess. This might seems like a strange category, but due to the core of the Gundam franchise being about mechas blowing each other up (IMO), I figured it was important to discuss this in detail. While past Gundam series have always had a decent case of what I'll call Dragonball Z Syndrome (i.e. talking in the middle of a fight), Unicorn has a near terminal case. The flow of combat is constantly interrupted by impromptu conversations held between pilots, even when they are enemies with each other. Although I'd make the argument that past series would be better if the flow wasn't interrupted as much as it was, it never got to the point where I was actively groaning that I hope they start fighting again. In regards to combat strategy, this series basically has none. In past series, whatever factions the MCs belonged to would come up with strategies to win the battle. In other words, there was a good sense that these were somewhat realistic, strategic military battles. Unicorn's battles feel like poorly thought out skirmishes where each side hopes that their fighters are stronger than the fighters on the other side. This is a little bit understandable since the scale of the conflict in Unicorn is smaller than the earlier series, but still, the faction leaders could at least put a little bit more effort into their combat plans. In regards to the individual battles throughout the series, very few people are shown using any basic strategies. Mostly they rely on magical shields and flying pod lasers to fight and defend. I think a character used an asteroid as cover once in the entire series. It's really disappointing to see this as Gundam has a history of pilots making the best use of their environment in order to win. Instead the pilots use their mobile suits as nothing more than amplifiers for their pre-existing special abilities. This is a problem I've had with other Gundam series as well, where it feels more like a super-robot show rather than a real-robot show, but Unicorn is one of the worst offenders yet. Expanding a bit more on the pilots' abilities, people like Amuro and Kamille were decent pilots when they started out, but they weren't great. They basically had to rely on their natural talent, their usually OP mobile suit, and the support of other characters to get them through a battle. As time went on, they became very good pilots, and combined with their other abilities, they became extremely effective in battle. In Unicorn, this isn't what happens. Banagher can immediately pilot his mobile suit extremely well and there's almost no development in his fighting ability. So not only did the writers forget to develop his actual character, but they forgot to develop his physical and mental attributes as well! Generally speaking, it's all very good. The animation looks great, with the mobile suits being particularly well-done. The sound effects and BGM are also great. The art quality is basically the only thing that saved this series for me. So even though I found everything else sub-par, the battles are still fun to watch. I watched the English dubbed version and the voice acting was quite good. Everyone's voices seemed to match up with their intended characters, and the performances themselves always matched up to what was happening on screen. In other words, no complaints here. As a whole, Unicorn really disappointed me. The visuals combined with it being set in the UC Timeline made me hope they would be doing something interesting. Instead, it was just a compilation of poorly re-imagined characters, the inclusion of elements that dragged past series down, and generally poor writing all-around. Seriously, don't read any of this unless you've seen the whole series. This connects to the disruption of combat mentioned above. While many other Gundam series have had the same out of body things occur during fights, none of them seemed to break up the action like Unicorn did for me. Also, very few people express shock when it happens. I know we’ve seen it before in past series, and that the universe is probably used to new-types by now. But, I still think communicating telepathically or spiritually with another person would freak most people out. Banagher doesn’t know he has killed someone until he is told after the fact. He expresses shock, but then gets over it by the end of the scene. It seems kind of strange that it isn't ever brought up again in any detail given how much he complains about killing in general throughout the rest of the series. The location where it is found is actually more useful than the box itself, since the location has infrastructure that allows Mineva to talk to all of humanity at once in an attempt to change their mind on how to govern space people. Yet, there's no indication of whether it worked. There isn't even a single scene of the general public watching her broadcast. The two ship captains are also seen clearly ignoring what she is saying as they discuss getting drinks together. It's strange that the whole series revolves around each faction arguing about what the future should look like, and then no one listens when someone lectures them about it. Also, the extra article in the founding principles only holds importance if people want it to. The current government can just say, "We didn’t sign that into law." Not to mention people have never operated under the belief something like that was ever true, so why should it hold so much weight all of a sudden? If something like that was important enough to the general public, they would have made it a law already. Clearly a large portion of people just flat out disagree that the space-noids should have more self-control, so it's not like some 100 year old slab is going to change their mind. The only truth is the one people choose to accept. Sometimes you want to watch a show but there just is not enough time for a full-fledged television program. That is where OVAs come in and we here at MAL are ready to highlight some of the best independent(ish) OVAs out there for you.